Today as part of Kidlit Week we are happy to welcome author Corey Rosen Schwartz! Corey is the author of some fabulous retold tales: NINJA RED RIDING HOOD, GOLDI ROCKS AND THE THREE BEARS, and THE THREE NINJA PIGS. Wolf just can’t catch a break! Ever since the three littlepigs started teaching everyone Ninja skills, huffing and puffing just hasn’t been enough to scare up a good meal. 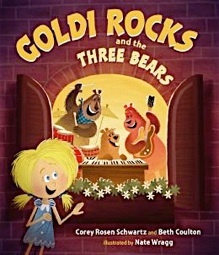 This mash up of Goldilocks and the Three Bears and American Idol is a surefire storytime hit. When the big bad wolf threatens their village, three pigs sign up for different martial arts lessons to prepare to take him down. Pig One and Pig Two don’t stick with their training, though, and are no match for their foe. But after practice and dedication, Pig Three becomes great at karate (including perfecting the perfect pork chop!) and saves the day. This giveaway is open to all Sub It Clubbers whether you’re in our Facebook chat group, follow our blog here, follow us on Twitter, or all of them. Tell us where you take part in Sub It Club and which of Corey’s books you want to win in the comments. Love the way you rejuvenated old fairy tales! Goldi may rock, but so does Corey! You’re my rhyming hero, I love your books! I use facebook and email. I love it! Hooray! I have THREE NINJA PIGs but would love either of the other two. I’m in the Facebook group and follow the blog using Feedly. Hi! Loving this celebration! And I’d love the Three Ninja Pigs (missed this one, somehow!) Thanks, Corey and Sub Six. I follow the blog and on Facebook. I follow SUb It CLub everywhere. I would love either both. Thank you!! Like Sheila, I also follow Sub It Club everywhere!! Love it, love it, love it!! And happy birthday to the wonderful founders and all the great members. I’m partial to the 3 Ninja Pigs, but would be happy with any of the titles. Love a retake on an old tale, bravo! I am following Sub It Club on Facebook, Twitter, and the blog. It is a wonderful resource! Thank you Sub It Club. 🙂 I would be happy with any of Corey’s books, but “Ninja Red Riding Hood” looks particularly fun to me. Corey rocks! (and rhymes brilliantly!) I’d love to win the Ninja Pigs book. I’m in the Facebook group. I’d love to win a copy of Three Ninja Pigs. This has been a great line-up so far this week. Thanks to all the Sub It Clubbers who made it possible. Following you all on Twitter, Pinterest, and FB. These books are great and I would be happy to win any of them! I’m following this blog, Facebook and Twitter- Congrats on the first two years! I follow you on the blog and Facebook. I would be happy with any one of the three books! 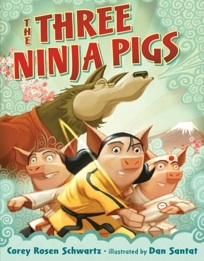 I follow on twitter (@GomezWrites), and I would love to win a copy of The Three Ninja Pigs to give as a gift! Email is how i follow you. Don’t have any of the books and they all look fascinating. I would love to win Goldi Rocks and the Three Bears. What a great giveaway! I follow you through email and on Facebook. I do all three of course! I have a lovely autographed copy of THE THREE NINJA PIGS and of course I would love to have NINJA RED RIDING HOOD! What creative take on three classics. I follow your blog. I would love a copy of “Three Ninja Pigs” Thanks. 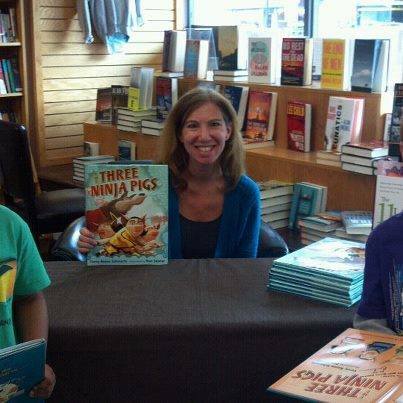 I would love to have a copy of “Three Ninja Pigs.” I am in the Facebook group and follow the blog. I would love to win Goldi Rocks and The Three Bears. I’m a member of the Facbook group and follow on Twitter and Pinterest. I follow on FB and would love a copy of Ninja Red. I follow here, FB and twitter! I donate any books I win or am given to my library. Any of these would be awesome! Facebook and I can’t decide–I’d love to win any of them. They all look great! My son is a taekwondo ninja :). We would love to win a copy of one of Corey’s books! I follow here, Facebook and Twitter. I would love to win Ninja Red Riding Hood! I follow on Twitter and FB. This is a tough choice because I love all three. I’d probably have to say Ninja Red Riding Hood. i have been wanting to read these. I’m part of the Facebook group! I’m in the FB group. Congrats on 2 years. You have done such a great job. Love Corey’s books. Would love Three Ninja Pigs. We love Corey’s books! 😀 I’m a part of the FB group!! Follow on Fb and Twitter. I love Cory’s books. I have the both of her Ninja books (of course seeing that my son is a Black Belt 😉 I would love GoldiRocks! I have copies of all three of these, but would love to win one for the ReFoReMo community! Corey rocks! Do I have to choose one of her fab books? (I love them all) But if you’d like me to enter only one drawing, then I will choose Ninja Red. I follow Sub It Club in all forms- FB (both), Twitter, Pinterest, and link you to my blog, as well. Would love to win a book from the fabulous Corey Rosen Schwartz! I am a member of both Facebook groups and follow on twitter.